I have been given a PNG image of a simple logo and with a transparent background. Size needs to be reduced but the smaller image has jagged edges. I have tried to keep the resolution unchanged, and I even tried to lower the resolution but without result. In this case it may be quicker to create the logo again in the correct size but I would really appreciate a chance to learn why this happens and how to avoid it. Please note that the logos contain white text and therefore do not display well below. To keep the anti-aliasing, save your image in a format that support partial transparency (typically, PNG, like your source image). If the GIF format is required (but why would it in 2018? ), before exporting to GIF you can use Layer → Transparency → Semi-flatten to create anti-aliasing edge pixels over a predetermined color. But of course the picture can only be shown over a background of that color, which somehow defeats the purpose of the transparent background. 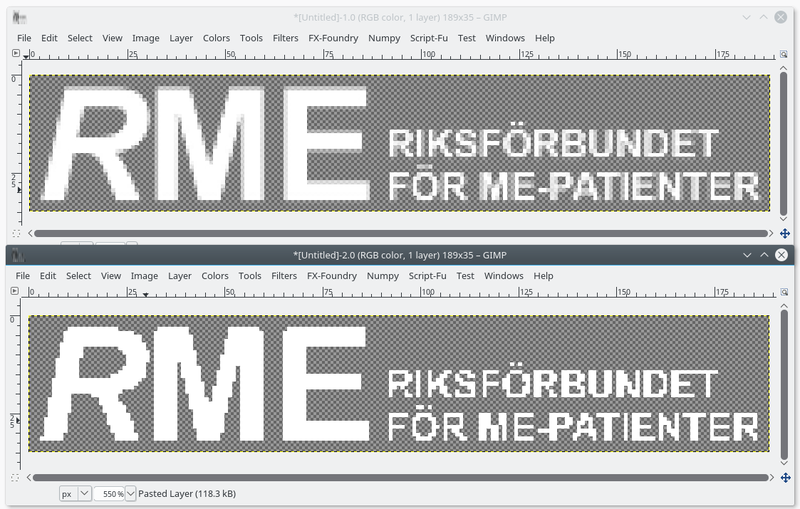 PS: If you make the image color-indexed explicitly in Gimp (Image → Mode → Indexed), then Gimp will show you the layers with the GIF “binary” opacity. If you are in full RGB mode, this only appears when the picture is exported to GIF. Not the answer you're looking for? Browse other questions tagged gimp png gif or ask your own question. Icons and illustrations in GIMP without jagged edges?